Please note that the content of this book primarily consists of articles available from Wikipedia or other free sources online. 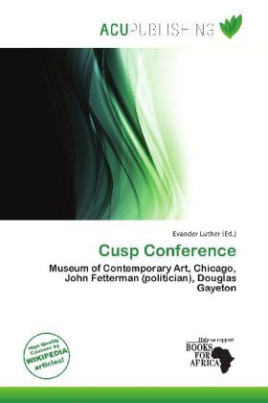 Cusp Conference is an annual gathering of thinkers, innovators, creators, skeptics, believers, visionaries and explorers from the arts, sciences, technology, business and design. A conference "about the design of everything" created and hosted by design firm smbolic (formerly SamataMason) and held at the Museum of Contemporary Art Theater in Chicago, Cusp is centered around the idea that virtually everything that exists has been designed - by humans, by nature or by some other force. Cusp Conference presenters have touched on topics as diverse as landscape waste, contemporary dance, electric vehicles, democracy, social media, education, intellectual property law, medicine, virtual worlds, typography, green architecture, evolutionary biology, smell and taste and serious games.